Today we do a double feature of two different style of films, one classic Epic Hollywood the other a modern dramatic War Drama. Both lovingly brought out on Special Feature Blu-ray by the one an only company Twilight Time. Both features are truly worthy to praise in their own unique ways. Both have never looked and sounded any better. Twilight Time did a fantastic job of bringing these out on 1080p High Definition Blu-ray’s. Each has a loving quality and master imprint placed upon them. Twilight Time shows such care and beauty toward cinema. Both Khan and Huang Shi show the mastery that Twilight Time shows to feature film. This is directed by a man who had a long career, in the movie business as director Henry Levin. Bringing to reality many interesting films of all genera of cinema. From the likes of horror, such as 1944’s Cry of the Werewolf, to mystery, action, musical, drama, western, and just about any style you can think of, Henry Levin did. He was a hit and miss, director. Some of his films are not great, and some of his films are amazing, including 1946’s The Count of Monty Cristo. Each of his films, no matter if they are lower quality or higher quality, they were not flawed in the talent that Levin brought to what ever feature he was creating. He has a style that was memorable, and stood out, no matter the film. He directed another film that Twilight Time has lovingly transferred to Blu-ray, 1959’s Journey to the Center of the Earth. Starring a wonderful cast of actors and actresses. Such talent as the one and only master actor and one of my true favorite performers Omar Sharif. Sharif was one of the greatest performers to ever grace Hollywood. His mastery bleeds off the screen and creates a dynamic reality for the watcher. He has starred in so many favorite films of mine. Including one of my all time top 20 films 1965’s Doctor Zhivago. One can not forget his powerful performance in 1962’s masterpiece Lawrence of Arabia. Another favorite of mine if 1968’s golden ticket Funny Girl. Whatever he did, he shined in so many flawless ways. I love seeing him act. Watching him in Genghis Khan is no different, truly a master talent. 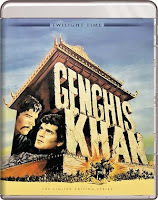 Genghis Khan is one of those classic Hollywood epic style films that the 50’s and 60’s mastered. Now with that said that does not mean it does not have its major flaws. The movie has no real basis in historical setting. The movie is more Hollywood than actual history lesson. There are some grand battles but few in nature. The movie has the basis of great acting, stage sets and epic style story telling. If one goes into this wanting a history lesson they will majorly be let down, but if one goes into this wanting away to blow 2 hours in great Hollywood style of filmmaking, then it’s a total winner. I for one like this film. I like any film starring Omar Sharif, so to me it’s a must see film for any fan. Plus, this movie has never looked any better. The colors are vibrant, and the audio is fantastic, making this a very enjoyable experience. Next up is The Children of Huang Shi. What a fantastic movie. An awesome choice by Twilight Time to bring forth this starred studded little gem. A wonderful flawless cast of performers. A true treat as always in acting is the amazing Jonathan Rhys-Meyers. He has always been on my radar. He starred in one of my top 50 films of all time, the amazing one of kind Titus which might I add that Twilight Time has honored with a Special Edition Blu-ray. Also starring the one and only Chow Yun Fat, who is always a golden ticket in my book. Fat has starred in so many epic films. Also starring the master talented Michelle Yeoh. With a cast like that what more really needs to be said that should draw the viewer in just for that reality. 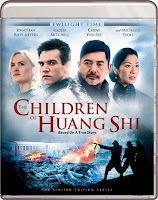 To me THE CHILDREN OF HUANG SHI is an epic war drama that should be seen. It’s a modern film that displays itself as a true classic of cinema. Twilight Time did a great service to this film in bringing it to Blu-ray. This is about young British journalist, named George Hogg. He alongside an Australian nurse ends up saving many orphaned children during the Japanese control of China in 1937. This is a moving drama that captures heart ache and brutality of war. But it also captures the courage and heart warming reality of caring hands during a brutal reality. Both features capture a wonderful, flawless reality that Twilight Time does so well. Each movie is crisp in imagery. Vibrant in color quality and most of all the audio is spot on for both features. I feel Twilight Time always masters this department. Khan and Haung Shi are both prime examples of how to treat and create new outlets to feature films. Special Features: Isolated Music & Effects Track. The music created in this feature film is done by Dusan Radic. Radic started his career in the 1950’s and created music for feature films up to the 70’s and it seems that is where he dropped off in the music movie world. Most of his work was of the Foreign Film nature other than 1964’s The Long Ships starring the wonderful Richard Widmark. Isolated Music Track: The music for this film is done by a wonderful composer. A true talented musician that can capture drama and life inside his work. For working on such master talented movies as 1996’s masterpiece Shine, to the amazing 1998’s Elizabeth to 2015's The Dressmaker and many others. David Hirschfelder is a master talent and was honored with this special feature on this amazing Blu-ray. Yet again Twilight Time has brought out two feature films with a high quality transfer and a beautiful reality to watch these features on Special Edition Blu-ray's. Two films, two totally different subjects, yet both lovingly featured with great care by Twilight Time.